This is a brief round up of information coming out from the ceremony awarding Chelsea the Sam Adams Award for Integrity in Intelligence. It will be added to as more information comes in. Supporters were handing out flyers etc outside and there will be more on this to follow. (Note: 21st Feb – Now up – follow link at end of post). The following information is gratefully put together via live tweets from @silkiecarlo, whose website, where you can find links to a couple of interesting pieces of writing on the Sam Adams Associates, is here, and who has now reported the evening here. Ray McGovern, the founder of the Sam Adams Associates & Award, began the proceedings appropriately by introducing the Collateral Murder video, which, first released on 5th April 2010, nearly four years ago, now stands at 14,521,410 views on YouTube. Craig Murray reminded people of the 2012 award ceremony (Jan 2013) when Thomas Fingar was the recipient and Julian Assange spoke by video link from the Ecuadorian Embassy against a backdrop of footage from Collateral Murder. What if the Collateral Murder video had come from the Syrian Govt? Would it have been a war crime then? it’s obvious that the situation is out of control and the trend is worsening. Snowden lists the true cost of wars, instances of official corruption, rendition, torture and war crimes as information revealed in Chelsea’s releases to WikiLeaks, and says that the public unambiguously need this information to fulfill the role and responsibility of participating in the ‘self-correcting’ form of government that is the essence of American governance at its best. delivered the acceptance speech that Chelsea had written, and received the award on her behalf. You can read Chelsea’s Acceptance Speech, which, similarly to Edward Snowden’s tribute above, focuses on over-classification and the concentration of power to the detriment of justice, but brings in what she implies is a new angle for her, here. In the speech Chelsea raises the case of Anwar al-Awlaki, which, as the instance of the first American citizen to be intentionally targeted and killed by an American drone strike, was unprecedented, and the challenge to compel release of FOIAs brought in the courts by the ACLU and NYT. is an illustration of the situation we now have, where a level of power is being claimed by the Executive that runs completely counter to the Constitution of the United States and the founding fathers’ intentions, and has resulted in the sort of ‘Star Chambers’ justice that is becoming the norm. this level of secrecy, obfuscation, and classification or protective marking…….. ……breeds a unilateralism that the founders feared, and deliberately tried to prevent when drafting the American Constitution. Chelsea relates this to her own trial, where she was charged with ‘aiding the enemy’ and where the lack of transparency regarding documents was scurrilous (and a key reason for the lack of public knowledge concerning her case). whether the American government, and particularly the same President and Department, have the power to unilaterally determine my guilt of such an offense, and execute me at the will of the pilot of an Unmanned Aerial Vehicle? It is becoming increasingly clear to me that the dangers of withholding documents, legal interpretations, and court jurisprudence from the public that pertain to the right to “life, liberty, and property” of a state’s citizens is as fundamental and important to protecting against such human rights abuses. a society that puts secrecy – in the sense of state secrecy – ahead of transparency and accountability will end up neither secure nor free. It was notable during the trial that Chelsea was playing an integral part in her own defence, and we hear from the family that she is working on her appeal, so, knowing her probing intellect, it’s not surprising she should be organising her thoughts on the abuse of the legal process and its contribution to the abuse of human rights right now. As ever, Chelsea’s communication, as @silkiecarlo, who posted it from Aaron Kirkhouse’s transcript, reported, is ‘excellent and eloquent’. But also, as the report of the Welsh family visit indicates, Chelsea is obviously able to be more relaxed now the trial is past and she has settled down in Leavenworth, and I think this seems reflected in the tone of the speech. 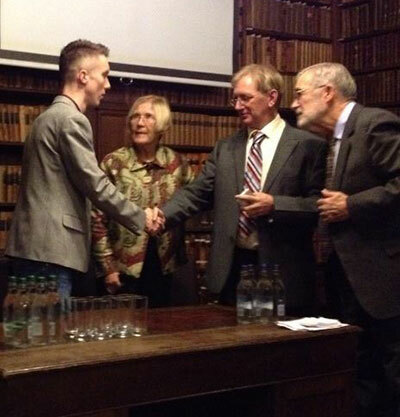 21st Feb. We now have a fuller report of each Sam Adams Associate’s speech up, which also includes pictures from Genny Bove – ‘Solidarity for Chelsea Manning: Oxford Vigil and Sam Adams Award’. 25th Feb. Andy Worthington (@GuantanamoAndy), a historian and journalist whose crucial work on Guantanamo you can see on his website, worked as a media partner on the release of the Guantanamo Files (DABs or detainee assessment briefs) that Chelsea made available to the public through WikiLeaks. He was also at the presentation and has posted some photos and a report here. Gallery | This entry was posted in Analysis, Manning, Reports, Snowden and tagged Aaron Kirkhouse, Acceptance Speech, Ann Wright, Annie Machon, Anwar al-Awlaki, Chelsea Manning, Collateral Murder, Colleen Rowley, Craig Murray, Edward Snowden, jurispridence, leafleting, over-classification, Oxford Union, Ray McGovern, Sam Adams Award, speeches, Todd Pierce, trial, video. Bookmark the permalink.